On January 28, 2018, at the Wells Fargo Center in Philadelphia, Penn., the first-ever Women's Royal Rumble Match took place with young Superstars and veterans of generations past sharing the ring. The historic match was a thrilling collision of past and present. The first surprise was Lita, who entered at No. 5 and displayed the names of late Superstars—who never got to see this historic moment come to fruition—on her arm. She was followed by Torrie Wilson (No. 9), Molly Holly (No. 12), Michelle McCool (No 14), Vickie Guerrero (No. 16), Kelly Kelly (No. 19), Jacqueline (No. 21), Beth Phoenix (No. 24), Nikki Bella (No. 27), Brie Bella (completing her comeback at No. 28) and finally, Trish Stratus at No. 30. Asuka, Sasha Banks and The Bella Twins survived all the way to the final four. The Boss and The Bellas wisely ganged up on Asuka, but Sasha, who was the No. 1 entry in the match, got a little too enthusiastic and shoved the twins aside to get her shots in on The Empress of Tomorrow. Nikki and Brie responded by tossing her over in unison. The Fearless One shocked the WWE Universe when she eliminated Brie moments later, mouthing the unmistakable words to her stunned sister: "I want this." Asuka, as it turns out, wanted it just a little bit more. Despite suffering a Rack Attack 2.0, The Empress of Tomorrow lured Nikki into a slugfest on the apron. And it was Asuka, with a quick-thinking swipe of Nikki's legs, who was the last woman standing. 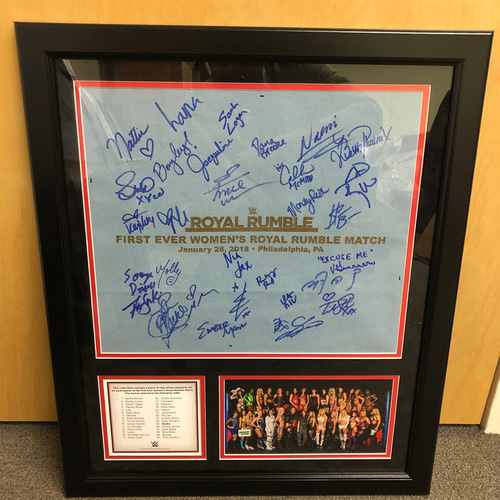 This plaque contains a piece of ring canvas signed by all thirty participants of the Royal Rumble—an almost impossible group of signatures all on one mat. This plaque was produced in very limited quantities. Each participant in the match received one of these exact plaques. With fewer than 50 plaques available for sale, this is sure to become a favorite piece of collectors. 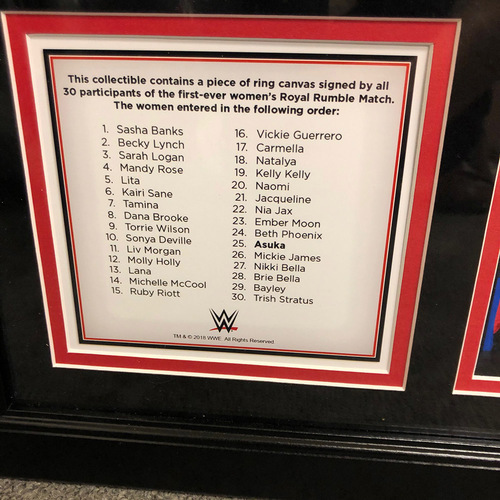 Truly a chance to own a piece of WWE history!